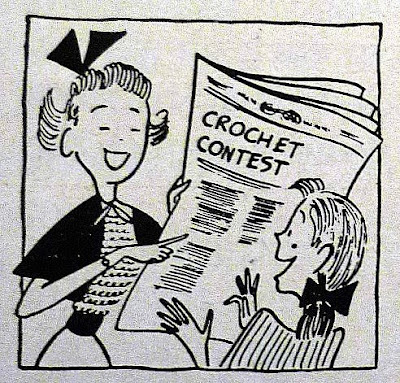 It is no secret that I love vintage crochet magazines, and when looking through one of my latest aquisitions, I found a call for entries for a National Crochet contest in 1950. They had photos of previous winners work, and a photo of the entries on display from 1949. I would have included that one in this post, but it was really difficult to see what was in the picture. 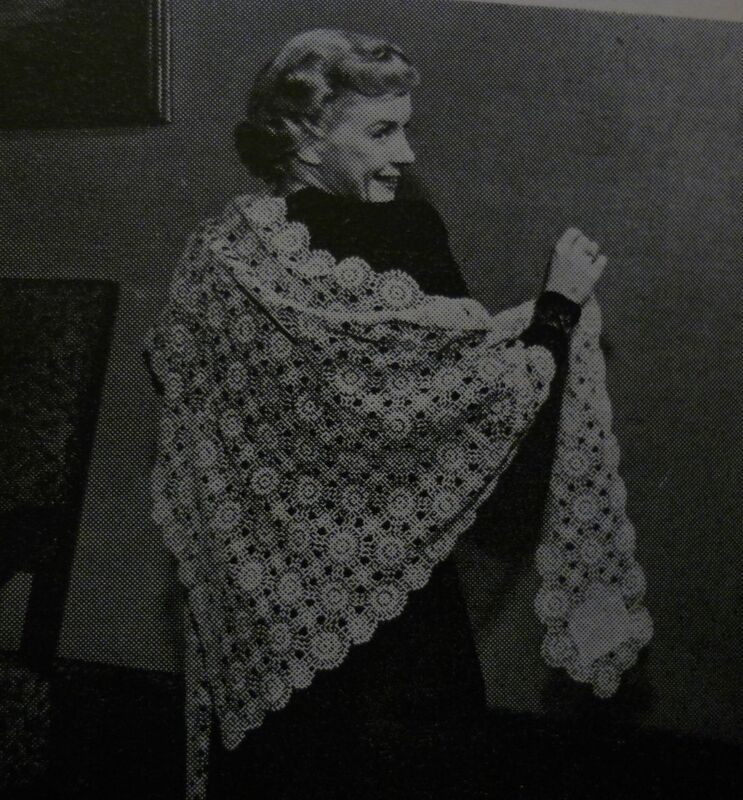 From what I could gather, it was all flat pieces, i.e., bedspreads, table clothes, shawls, etc., done in delicate thread motifs. If you have a look at Doris Chan's photos of the entries from this year's CGOA Design Competition, you will see that things have changed in so many ways. Most of the pieces were done in yarn, there were many different types of garments and objects, and there were also mixed media pieces. I would love for the judges from the contest of 1950 to see this years exhibit at Chain Link. With the exception of the lace and thread pieces, they might not recognize the craft as crochet! 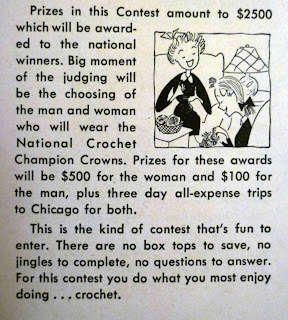 The prizes in 1950 were very generous yet unfair; $500 for the best woman's entry, and $100 for the best Man's. I wonder if the men felt slighted? The photo of the man below is intriguing. He looks so proud holding his trophy. 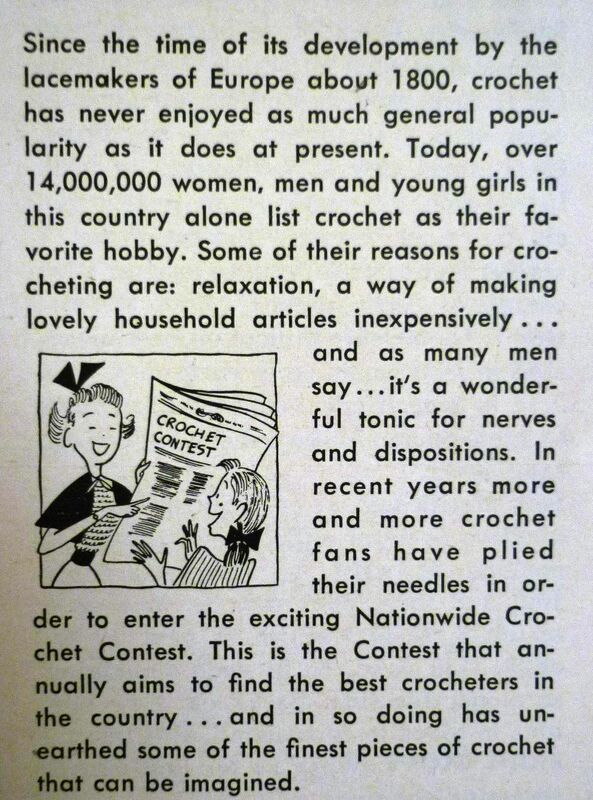 I am so pleased to discover how crochet competitions have evolved over the years. 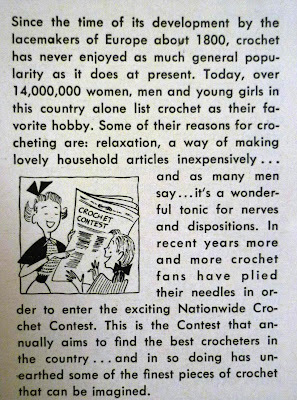 It is a wonderful thing to create an amazing crochet piece, whether it is the year 1948 or 2010. 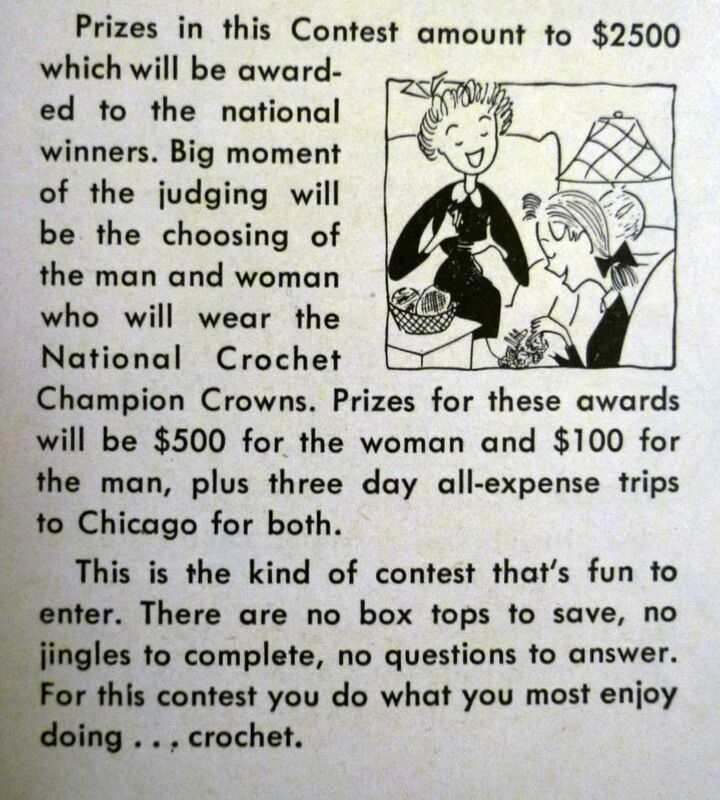 I think the "purse" for the 1950's crochet contest might possibly represent one of the only situations in the history of man(and woman)kind where a woman ends up with 500% more than a man. I don't think we should feel too bad about it, all things being (entirely UN)equal! As always, I love the vintage relics. Thanks! You are welcome, Joanna! Thank you for your comment! You are probably right! Wow. This web site says that the relative value of the $2500 prize today would be anywhere from $18000 to $121,000... Amazing! http://www.measuringworth.com/uscompare It's nice to know that creative work was valued at one point in our history. I wonder how we return to that?